It’s a great spot for a birdwatcher – it’s close to rainforest, rivers, estuaries, sandy beaches, rocky headlands, offshore islands, human-made plantations and the high country of the Tablelands. This mix of habitats and altitudes makes it a fascinating place to spend quite a few days, to see many of the Wet Tropics specials and get the feel of the environment. Even manicured gardens may attract over 20 species, and it is just a short walk to see birds like fruit-doves, pittas, riflebirds, shrike-thrushes and stone-curlews. In the monsoon (Wet) season, Greater and Lesser Frigatebirds may sail along the coast, getting out of the way of an incoming cyclone. Beaches and rocky headlands – Beach Stone-curlews inhabit the sandy beaches, while Grey-tailed and Wandering Tattlers have been seen on rocky shores. Edmund Kennedy Memorial Walking Track. It’s not often that one can follow the track of an early explorer, but here you can, starting by the South Mission Beach boat ramp and ending at Hull Heads in Hull River National Park. It’s a long walk, but even the first part to Tam O’Shanter Point is worthwhile, for birds and beauty. Eastern Osprey, Superb Fruit-dove or Southern Cassowary may be seen along the way (cassowaries often walk on the upper beach here due to fences around large properties nearby). (Musgravea Track), Djiru National Park is an excellent long walk, although parts of the track may be closed, depending on present conditions. Southern Cassowaries may be seen (droppings and footprints guaranteed), as well as Victoria’s Riflebird, Rose-crowned, Superb and Wompoo Fruit-doves. Djiru National Park though short, is a very good spot to visit. Noisy Pitta, Spectacled Monarch and Spotted Catbird may be seen, and Buff-breasted Paradise Kingfishers arrive for the Wet Season. Tully Gorge is accessible via Tully and is a good place for honeyeaters, gerygones, Barred Cuckoo-shrike, Yellow-breasted Boatbill and other forest birds. There is a short informal track down along the river but be cautious as the Tully River is very swift and water levels may rise suddenly. Bicton Hill, Clump Mountain National Park – the rainforest track up to the top of the hill may produce anything from a fantail to a cassowary and the view at the top is spectacular (unless it’s clouded in). Hull River and Hull Heads – you’ll need a boat to explore the river, but walking around boat ramps and the river mouth may produce terns, herons or Eastern Osprey. Family Islands National Park – for most of the lowland forest and coastal birds you can see on the mainland, but with a resort added in. If you don’t want wet feet, take the ferry not the water-taxi. Murray Falls is a popular and pretty place, good for cooling down in the river. The usual forest and open country birds (e.g. finches and grey whistlers) are here. Mena Creek, is at the eastern end of the 26 km Gorell Trail, following old logging roads through valleys and ridges. Parts are not very “birdy”, but it is a beautiful and interesting walk. Birds Australia North Queensland has a North Queensland bird list and useful birding guides for a number of locations in North Queensland, that may be downloaded and printed for personal use. ﻿﻿“﻿﻿Tropical Walking Tracks of North Queensland﻿﻿”, ﻿﻿by Kym Dungey and Jane Whytlaw, though aimed at bush-walkers, has many maps and detailed information on track conditions, directions, timing and other useful hints. 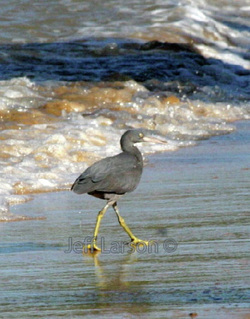 Many of the sites described are great for birding as they are often not on the “tourist trail”. If you cannot find this book in your local shop, order it from Footloose Publication. There are many places to stay in the Mission Beach area, in a wide range of rates and types of accommodation, so check for information here. A true nature lovers destination. Mission Beach BIrders Cottage is set in the rainforest at Bingil Bay. See what people are saying about their stay. 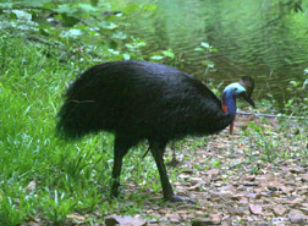 Licuala Lodge , is famous for its cassowaries, as the Lodge adjoins the “Garrett Corridor” containing good cassowary habitat in Mission Beach. The owners love birds and their website features the activities of their non-human residents. The Tropical Queensland Bird Trails lists species that can be seen and localities to visit, including the Mission Beach area. 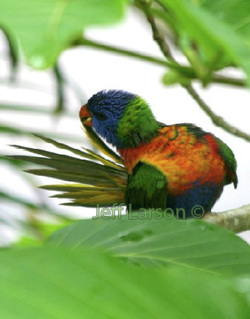 A big thanks to Helen Larson for the information on this page and to Jeff Larson for the wonderful photos.